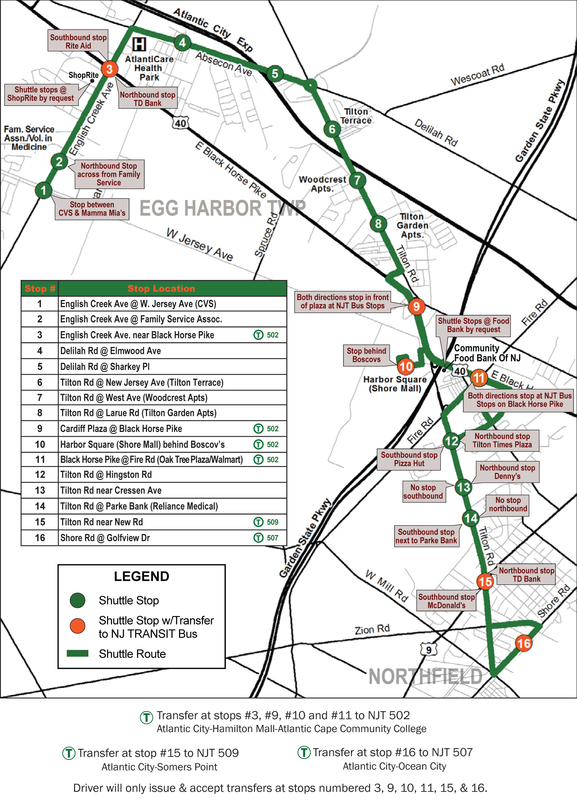 The English Creek-Tilton Road Community Shuttle, a deviated fixed-route service, serving the general public through Egg Harbor Township and the City of Northfield. 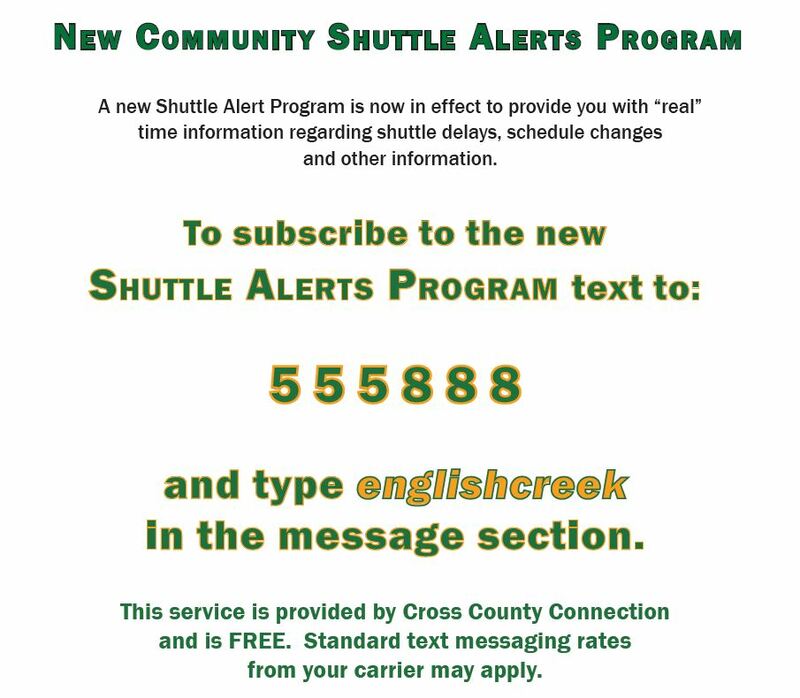 The English Creek-Tilton Road Community Shuttle is a partnership between The County of Atlantic, The Pascale Sykes Foundation, the South Jersey Transportation Authority, Atlantic Cape Family Support Organization, NJ TRANSIT and Cross County Connection Transportation Management Association. $1 each way. Exact fare required. Free for children under 6 accompanied by adult. Free with valid transfer from connecting NJ TRANSIT bus at stops numbered 3, 9, 10, 11, 15 & 16. 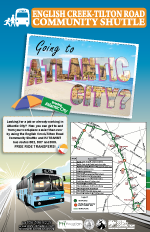 Free one-zone ride on connecting NJ TRANSIT buses at stops numbered 3, 9, 10, 11, 15 & 16 with valid transfer from English Creek-Tilton Road Community Shuttle. Service is curb to curb. Drivers cannot exit the bus. 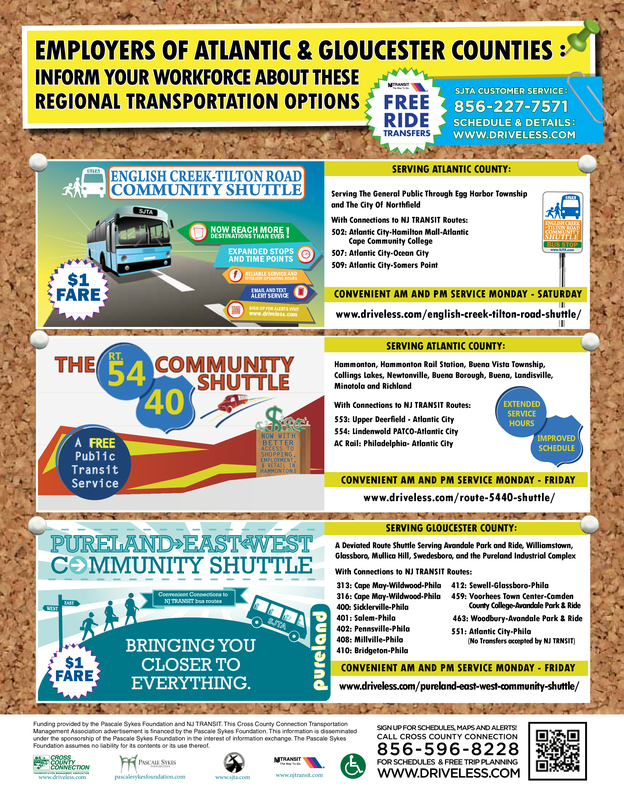 The shuttle may deviate up to 1/8 of a mile off the route by request. A route deviation reservation must be made by calling Customer Service (856)227-7571 by 12:00 pm the day before traveling. 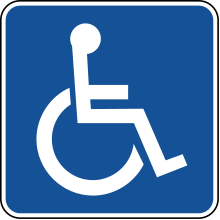 Drivers cannot exit the bus except to deploy the wheelchair lift. Pets, smoking, eating, drinking, littering and loud music not permitted. Harassment of riders or driver, or profanity will not be tolerated. 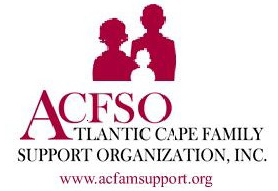 The English Creek-Tilton Road Community Shuttle is a partnership between The County of Atlantic, The Pascale Sykes Foundation, the South Jersey Transportation Authority, Atlantic Cape Family Support Organization, and Cross County Connection Transportation Management Association. Lift service available. Please call Customer Service (856)227-7571 to make a reservation by 12:00 pm the day before travelling. Service animals and portable oxygen tanks are permitted. Timetable available in alternative formats. Funding provided by the Pascale Sykes Foundation and U.S. Department of Transportation, Federal Transit Administration, through NJ TRANSIT. The South Jersey Transportation Authority (SJTA) operates it programs and services without regard to race, color, or national origin in accordance with Title VI of the Civil Rights Act of 1964, as amended. Any person who believes that she or he has been aggrieved by any unlawful discriminatory practice under Title VI may file a complaint in writing to South Jersey Transportation Authority (SJTA), 512 Lakeland Road, Blackwood, NJ 08012 or shuttlesupport@sjta. com. Transportation services provided by this agency are in whole or part funded through federal funds received through NJ TRANSIT and as an individual you also have the right to file your complaint to both SJTA as well as the Federal Transit Administration, by writing to: Title VI Program Coordinator, East Building, 5th Floor – TCR, U.S. Dept. of Transportation, Federal Transit Administration, Office of Civil Rights, 1200 New Jersey Ave., SE, Washington, DC 20590. A complaint must be filed within 180 days of the alleged discrimination. Para obtener ésta información en otro idioma, por favor llame a 856-227-7571.